All she heard was a crack. Then excruciating pain coursed through her body as her teeth shattered from the shotgun blast. A malevolent person just blew off half her face, blinding her in one eye, and leaving her for dead. Destiny’s owner, “Mama” Sherry Stinson, replied yes, and a mission was born. The message came from a rescuer in Canada. A few phone calls later and we found out Gracie was a stray down in Seguin, TX, over 600 miles away from us in Oklahoma. Animal control in Seguin said Gracie came up to them and laid her head in their lap. As most small town shelters, they were full. They couldn’t bear to put her down, yet knew the clock was ticking. They reached out to a local rescuer, Laurie Gaston-Marshall, who in turn reached out to her network of rescuers, one of which was Holly Eely, all the way up in Canada! Holly knew Destiny’s story, how she was a second chance dog helping others, and reached out. Holly also reached out to five other Facebook pages that day in hopes someone could help. 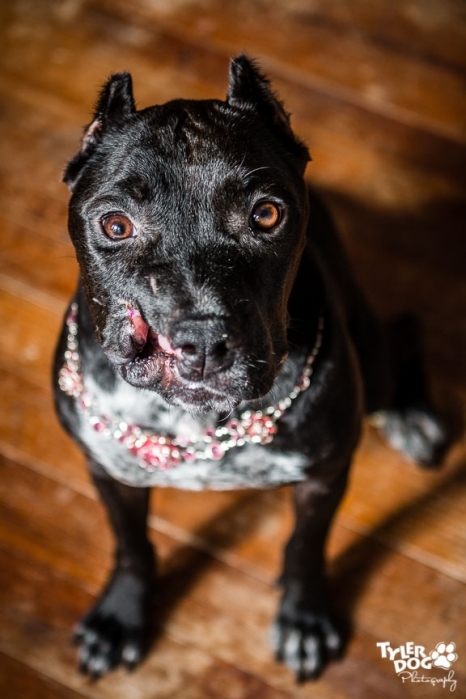 After a short phone call to Laurie in Texas, Destiny’s Mama reached out to her good friend, Misty Bilby, who runs Amore Pit Bull Rescue in Mounds, OK. Not even three minutes into the conversation, Misty said, “I’ll take her!” With the wheels in motion, now all that remained was getting Gracie to Oklahoma. A few days later, we piled into the Jeep and headed to Dallas, the halfway point to pick up Gracie. They decided to meet at Gilley’s, a bar made famous in Urban Cowboy, and fitting since it was a movie about redemption and second chances. 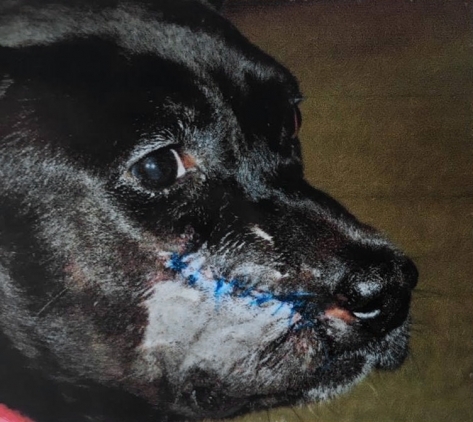 We stepped out of the car and there she was – this tiny, battle-scarred Pit Bull, a little shy, but with a tail that never stopped wagging. Misty fell in love at first sight, and I watched as tears fell from everyone’s eyes. We never had the answers. We knew Gracie was old and seen things no dog should see, had survived something horrific, but we didn’t know what. We knew she was ill. She was heartworm positive. Her mouth badly infected. Teeth horribly shattered. Underweight. And blind in one eye. Yet that tail never stopped wagging. So Misty took her to a variety of doctors to treat all her ailments. The heartworms. To be spayed. To check out her eye. Then to the doggie dentist. The dentist, Dr. Russell with Small Animal Clinic of Tulsa, said the teeth had to come out because the infection was dangerous and the fragments were terribly painful to her. Still, we had no idea what had happened to shatter her teeth so badly and rip up her face. The fateful day came for Gracie’s surgery. Dr. Russell was confident he could remove the teeth and create a flap for Gracie, so she’d no longer have a hole in the side of her mouth, which would also enable her to eat and drink without difficulty. That’s when we learned of Gracie’s past. Dr. Russell did x-rays revealing shotgun pellets. As he began removing teeth and bone fragments, he found more shotgun pellets. He told Misty, in no uncertain terms, Gracie had been shot in the face with a shotgun. Misty called me the moment she found out, her voice shaking with anger! “How could someone do that?! Why would they harm such an innocent creature? !” as her voice broke. I had no answers. I couldn’t wrap my head around it either. All any of us could do was seethe with anger. What kind of monster would do that?! How could anyone aim a gun at a dog, let alone unload a shotgun blast into their face, then leave them to die? Forgiveness. A word so easy to say, yet so hard to do for us humans. For Gracie, it’s an afterthought to a past she’s let go of. It’s a remnant of a time gone by as she basks in the glow of today’s sunshine. For Gracie, her world is full of love and kindness, afternoon walks, and lazy Sundays. Right here. Right now. With a tail that never stops wagging. 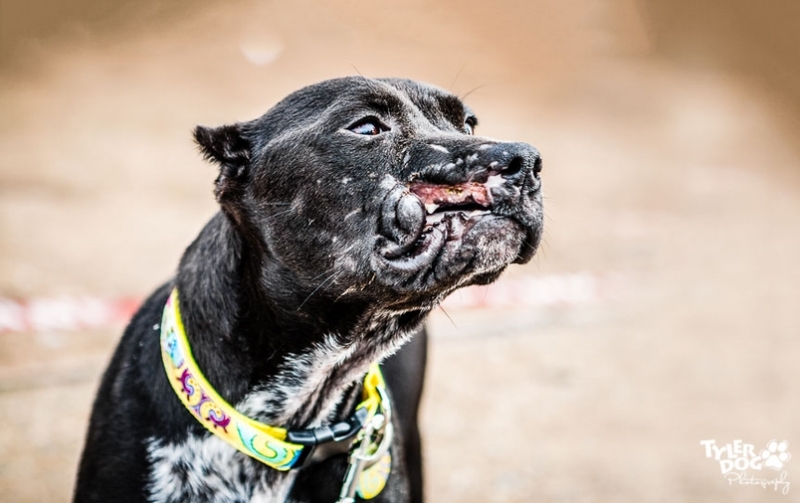 UPDATE: Gracie had an updated photo session, showing off her beautiful new face! Take a look!